Two years ago, there was one place in Vermont to get the lemongrass-scented, fish-sauce-rich cuisine of Vietnam. Two Saigons had fallen: Café Saigon, which occupied the building that now houses A Single Pebble in Burlington, and Little Saigon in South Burlington. Their demise made Vietnam Restaurant, a small storefront in Essex, the only option. During this dark age, many pho faithful were reduced to sipping the fragrant beef and noodle soup in Montréal. Then, a miracle: Pho Dang opened in Winooski, a hot spot for recent Asian immigrants. Pho Hong followed, bringing its gauzy, atmospheric décor to the former Burlington bus station. Between May and November of this year, three additional Vietnamese eateries cropped up. 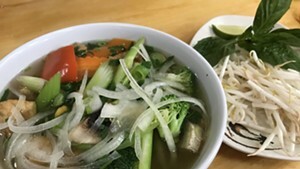 M-Saigon, a homey restaurant on Shelburne Road, opened just before Phuong’s Kitchen, housed near a Slurpee dispenser in a North Avenue convenience store. Most recently, Vietnam Restaurant launched a better-decorated sequel at the foot of Church Street. By now, most local Asian cuisine fans know their pho — or at least know they like it. But where’s the best place to get the goods? With all the options, it’s hardly obvious. So we took on the arduous task of vetting the vermicelli. As frequent visitors to some of these locales, we had our prejudices. That’s why, to be entirely fair, we tasted blind. Similar dishes from each restaurant were labeled with codes and sampled side by side. Our aim was to determine whose spring rolls had the most spring, whose pork brought home the bacon, and whose pho was, well, un-pho-gettable. As we realize that not all our readers have supped on Southeast Asian, we’re pairing our evaluations with quick primers on the dishes we tested. First, a note on a common Vietnamese ingredient: Fish sauce is what it sounds like. Called nuóc mam in Vietnamese, the funky condiment is made from the fermented remains of our friends in the sea. Blended with vinegar or citrus juice, water and sugar, it becomes a zingy dip called nuóc cham, which comes with many Vietnamese dishes. One can start a Vietnamese meal without cha giò, but we don’t recommend it. These blankets of fried goodness may be translated as spring rolls, egg rolls or imperial rolls. Pork almost always makes an appearance in the filling, and vermicelli ride shotgun. The accompanying dipping sauce can’t break a good cha giò, but a good one can make it. Wildly different versions of the classic roll from Pho Dang and Pho Hong — the former fit for consummate carnivores, the latter more nuanced — both hit the spot. Many modern diners consider slurping pho to be something of a religious experience — the street food even enjoys tribute groups on Facebook. Pronounced “fuh,” the noodle soup is made from long-simmered beef bones. Chunks from every part of the cow can enhance the meaty potage. Among Asian eaters, tripe and tendon are particularly popular. We opted for rare beef (usually thinly sliced flank steak) and meatballs. A far cry from what you’d find in Nonna’s kitchen, a Vietnamese meatball should be chewy and dense as a brick. Pieces of meat are not the only chunks in the soup: Onions, scallions or shallots deepen the flavor, and mix-ins such as thick bean sprouts, sprigs of herbs and lime wedges come on the side. If you’re not dining in, the rice vermicelli will be packaged separately, too, to combat sogginess, but it’s meant to be added to the mix. In this category, Pho Hong came out the winner. The soup-er sip featured gorgeously fresh accompaniments. While some other restaurants’ meatballs had a disturbing gristly texture, the Hong’s were springy and finely grained. In keeping with its name, we pronounced the pho at Vietnam Restaurant 2 second best. The broth was light and onion-flavored, with a strong hint of lemongrass. The meat, although not the leanest, was perhaps the best seasoned. When it came time to choose an entrée from each menu, we went with the approachable bun thit nuong, a combination plate that comes with a salad, grilled pork and rice noodles. The starchy stuff is nothing without nuóc cham to moisten it, so in this case, the sauce was key. Given the simplicity of the dish, we were startled by the variety we discovered. The best of the bunch came from Phuong’s Kitchen, where the lean, tender pork was bathed in a sesame-and-ginger marinade, much like that of a Korean bulgogi. Pho Dang was the bridesmaid. Its thick slices of marinated pork were chewy but packed with flavor. M-Saigon’s lemongrass-flavored entry was also notable. Our mixing, sniffing and sipping concluded, we decided that some good food is available at each of the five Vietnamese joints. Overall, Pho Hong performed the best, coming in first for its spring rolls and its namesake soup. Pho Dang and Phuong’s were the two runners-up, making us wonder what it is about the letter P.
Of all the rolls, these were the least crisp. The filling  which could have used additional seasoning  was mostly vermicelli and carrot. The vinegared daikon and bright orange carrots on the side were a saving grace. The classic combo of sprouts, lime and basil. Unfortunately, the basil had wilted somewhat in transit. A small container of chili sauce mixed with hoisin sauce came with the uncommonly thick vermicelli. Although the aroma wasnt particularly redolent, the broth was well balanced and meaty enough to please pho-hounds. The meat was extremely pale, a bit chewy and not super flavorful. But its immersion in a good broth helped compensate. $6.95. Comes with chopped egg rolls for an extra buck. You can really tell theres fish sauce in this one. The unusual preparation, in which the meat appeared to have been pounded with lemongrass, gave it a sour, herbal flavor. The veggie mix included bean sprouts, cilantro, cukes and lettuce. Great pickled daikon and carrot on the side. Highlights: Fresh garden rolls made with shrimp and pork. A large selection of soups. Smoothies and bubble tea in numerous exotic flavors such as taro, durian, papaya and litchi. Its Shelburne Road location  right next to Waterfront Video  makes it perfect for picking up dinner and a movie. Unlike all the other rolls we sampled, these were pure pork. Our helper, James, called them meatrific. Luckily, the flesh was well seasoned and anointed with sesame oil. Too bad the lettuce garnish was kind of sketchy. The murky broth had a lovely, rich aroma of star anise and cinnamon, but was less flavorful than expected. Nice sweet notes didnt compensate for a lack of salt and meatiness. It was a bit greasy, too. The portion was generous, but the super-skinny beef strips and the chewy meatballs were fairly bland. $6.50. Comes with chopped egg rolls for an extra buck. Sweet sauce the color of Mountain Dew. Could have used more vinegar. Deeply marinated and full of curry flavor, the meat was sweet, salty and savory. Iceberg lettuce and a few cukes were topped with chunky peanuts. The carrots on the side were spritzed with rice vinegar. Many different pho versions. Lots of rice and noodle bowls. Try the funky three colors dessert, a combination of coconut milk, beans and gelatinous worms. Its better than it sounds. The most varied of the bunch, these came stuffed with tiny flecks of pork, wood-ear mushroom, carrot, cabbage and vermicelli. The filling had a hint of ginger, and the sauce balanced tangy, sweet and spicy notes. A delightfully fresh sprig of basil, a generous lime wedge and lots of crisp bean sprouts, plus a little cup of chili and hoisin sauces. And noodles, of course. Best selection of the bunch. More flavorful than expected, given the relative clarity of the broth. It smelled like spices and lemongrass, and tasted sweet and meaty. It came with somewhat less meat than other offerings, but the delicious meatballs were more tender and less gristly than the rest. The meat strips, on the other hand, were fattier. Bright yellow and piquant, with floating carrot bits. The meat was very skinny and overcooked in places, with a sweet sauce. The bias-cut cucumber bits were crisp, as was the lettuce, but the peanut topping was over toasted. The mint was a nice, singular touch. A nice selection of Thai dishes in addition to the Vietnamese staples. Squid can be added to any stir-fry. The Spicy Sichuan eggplant shouldnt be missed. Multitaskers will appreciate the nearby laundromat. These homemade-looking rolls  which were somewhat mottled in color  featured lots of vermicelli, a smattering of carrot and very little meat, leading eaters to ask: Wheres the pork? The gloppy dipping sauce was pleasantly hot and sweet. Very unpleasant-looking bean sprouts  brown and mushy  and noodles, but no lime or herbs. The container of chili and hoisin sauce was barely filled. The broth was too salty. It featured scallions and blackened, wilted whole basil leaves, but no onion. Both the thick strips of beef and the meatballs were fairly bland, and the meatballs contained some gristle. Fish-sauce scented, with a nice mix of spice and vinegar. Smelling of sesame oil and tasting of smoke, this perfectly seasoned meat made us smile. The only veggie included was romaine lettuce. Luckily, it was perfectly fresh. 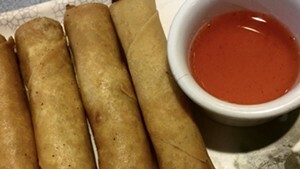 The chopped eggrolls added interest. Besides the Vietnamese offerings, serves some Thai and Chinese-style dishes, as well as Korean kimchi. A variety of rolls are available by the dozen. Less adventurous eaters can opt for burgers, cheesesteaks or buffalo wings. Lacking a meaty option, we got fried vegetable rolls instead. The cabbage-centric filling was a tad bland, and the rolls themselves leaned toward flabby. About what youd expect when you deprive yourself of pork, James noted. Sprouts and noodles, but no lime or herbs. A nice broth with lots of scallions and onions, and prominent herbal flavors of lemongrass and cilantro. It was both a touch sweet and properly salted. The pieces of beef were ultra skinny, and the meatballs had good flavor. Sweet, with tiny flecks of chili. The meager portion was disappointing, and the bits tasted mainly of soy. A mix of cilantro, cuke wedges and iceberg lettuce was cooling but bland. The peanuts were nicely toasted. Pan-Asian offerings, from lo mein to pad Thai, plus a couple of unusual vegetarian items. Tons of appetizers and stir-fries. An enigmatic beverage called cocktail juice. This one has the highest prices by far, but also boasts the best ambiance and a coveted Church Street location.